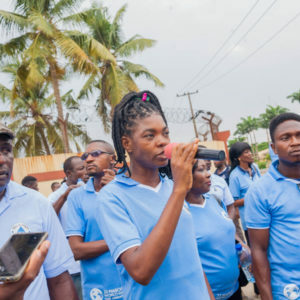 On the 25th anniversary of World Water Day in Lagos, our close allies the African Women Water Sanitation and Hygiene Network (AWWASHNET) and Environmental Rights Action/Friends of the Earth Nigeria (ERA), were rallying for the human right to water in Lagos, Nigeria. The threat of intimidation by local police did not shake our allies. They organized thousands of people — communities, people from across the city, and more — to gather in the streets and demand public solutions for Lagos’ water system. At the center of the rally, Veronica (Vero) Ivoke stood fearlessly, her gaze unflinching. There, she spoke out against the dangers of water privatization, echoing the unified demand of the people surrounding her: Water is a human right. It is not to be privatized. In Lagos, private water giants and their financial backers are exploiting the crisis to attempt to transfer public water into private hands. People’s needs are becoming a casualty of corporate greed: communities are left with dry taps, and many people are drinking unsafe water or paying exorbitant amounts of money for their most precious resource while decision-makers continue to pursue a dangerous privatization agenda. But Vero is a change-maker. Through her position as coordinator of AWWASHNET as well as through her work with ERA, she has played a leadership role in building grassroots power to protect water as a common good and advance the human right to water in Lagos. Motivated by the gross injustice of water privatization in Nigeria and beyond, she rises each morning to organize. And as she does, she helps accomplish victories with global ramifications. Democratically controlled, publicly accountable, and adequately funded water systems work. They have long been the backbone of public health, economic development, and environmental sustainability worldwide. Yet water privatizers’ misleading marketing and neoliberal approach to governance has deeply damaged public confidence in, and the will to adequately fund, this essential public service. Lagos is a thriving city, with the resources to build a robust water system. What’s missing isn’t money — it’s political will. The World Bank and other institutions have invested time and resources pushing privatization schemes to “solve” the city’s water crisis on government officials. And these dealings — especially with abusive corporations like Veolia — can be toxic. The consequences of privatization in Lagos could extend far beyond the city’s borders. “Lagos is basically a giant of Africa,” Vero explained. “So I believe that if Lagos is captured by the World Bank’s push for privatization, then the whole of Africa is likely to be captured also.” And if all of Africa’s water systems are privatized, the precedent could be set on a global scale. The abuses of water privatizers like Veolia are well-documented. Veolia has a disastrous track record around the world. And it’s no secret that communities of color — like in Flint, Michigan, and Pittsburgh, Pennsylvania in the U.S. — have at times borne the brunt of Veolia’s drive to control and profit from their water. In Lagos, and around the world, we can still prevent a corporate water grab, protecting millions of lives in doing so. That’s why AWWASHNET, ERA, Corporate Accountability, and our other partners around the globe are leading a movement to challenge corporate control of water. Vero talked about how water privatization is especially threatening to women, who are often in charge of their homes and family care and thus require larger amounts of clean water. The water crisis puts these women in the precarious position of trekking miles for the potable water they need to cook and clean, as well as to care for their children, their elderly family members, and themselves. ERA founded AWWASHNET in 2015 to bring these gender inequities to light and organize communities for change. The network, which comprises African women-led organizations and women activists who challenge water privatization, is among those leading the campaign to protect the fundamental human right to water — prioritizing female empowerment and community education. “[The water crisis] does not just affect individuals,” Vero said, “It’s a collective issue. Communities have to come together and speak as one so they can achieve positive results. The people power built by AWWASHNET’s community organizing is moving mountains. In partnership with ERA, they are making the impossible possible, and amassing nearly unprecedented pressure on the government to reject privatization altogether. When ERA and Corporate Accountability launched the Our Water, Our Right campaign in 2014, privatization in Lagos seemed like a done deal. Local government officials were even claiming there were “no political constraints” to privatization in the city; it would happen within months. So we did what we do best: organize. Together, we mobilized more than 200,000 Lagos residents to challenge the threat of water privatization in their city. We compelled the World Bank to end its push for a contract that would have set up privatization in Lagos. Twice, we organized members of U.S. Congress to issue a statement in solidarity with our campaign. And we generated widespread international media coverage. And as for the women Vero and AWWASHNET have organized in their communities? They’ve been at the forefront of this impact. They’ve marched and rallied everywhere from the streets to the governor’s office to his hometown. They’ve built a true movement for clean, safe water for everyone in Lagos. Ensuring clean, democratically controlled water, at rates everyone can afford and free from corporate clutches, won’t happen overnight. But Vero is committed to realizing a world where all people have enough safe water to meet their needs. She wakes each day undaunted, motivated to get out of bed and organize. The momentum Vero has helped build is growing, and her organizing is stopping pri­vate water corporations in their tracks. And that momentum is only building: This winter, we are partnering with ERA on a national summit on the human right to water. Together, we will broaden the base of support for the campaign across Nigeria, build media attention, move policymakers to endorse a national bill on the human right to water, and strengthen partnerships with campaign allies. Our campaign has successfully stalled privatization projects in Lagos. But neither Vero, nor those in the movement we have built together, are resting on their laurels. They want corporations to know that they are tireless. Fearless. Unstoppable.